The use of ear treatment candles (or cones) goes back thousands of years, evidence for its use having been found among Native Americans, Latin Americans and people from around the Mediterranean basin. Its main objective is to stimulate and cleanse the body’s energy systems, working on the acupuncture points in the ear and the peripheral lymph system. It is also effective in such conditions as sinusitis, glue ear, migraines, impacted wax etc. and for relaxation. Available from us: £6.99 including delivery within mainland UK. eg. 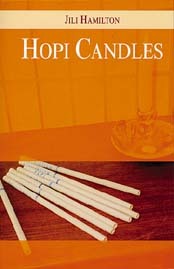 "re: Hopi Candles Book"
Natural Hopi Ear Candles Ancient Therapy of Ear Candling. Made of 100% pure natural beeswax & pure natural essential oils. Wholesale prices. Great value for money. Made in E.U.